THE family house at Tiruchuzhi where Bhagavan was born had to be sold in 1895 to clear debts. After changing several hands it came in 1934 in to the possession of the Tiruchuzhi Nadar Sangha. The Sangha ran a School the teachers of which were housed there. Some devotees felt that the house where Bhagavan was born was a sacred place and that it would be preferable to be acquired by Sri Ramanasrmam. There were several obstacles to the purchase of the building as it was a Trust property. Finally the Sarvadhikari, Niranjananada Swami stayed at Madurai for a couple of months in 1944 and succeeded in purchasing it. 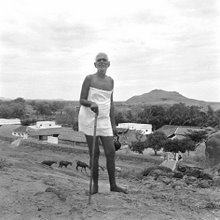 The idea was to name it `Ramana Mandiram' but Bhagavan pointed out "What do people of Tiruchuzhi know who Ramana is? They knew and respected father and mother. So let it be named `Sundara Mandiram'." Truly so. Sundaram Iyer was well known as a generous host. He was widely respected. Even robbers held him in great respect. Once some robbers surrounded the cart of a magistrate but when the `Vakil Sir' arrived at the spot accidentally, they left quietly and the magistrate escaped unharmed. On the appointed day, 13 September 1944, devotees from all over India arrived at Tiruchuzhi. The elders of the town received the Sarvadhikari and others with due honours and took them to the Bhoominatheswara Temple for performing worship there. In the evening the pictures of Bhagavan and his parents were taken in a procession in the town and just as in the case of the utsava moortis of the temple, appropriate poojas were performed to the pictures. The pictures were later kept in the `Sundara Mandiram.' From then on regular poojas are being performed there and in due course facilities for the stay of visitors were also provided. For Bhagavan's devotees Sundara Mandiram has became a holy shrine.